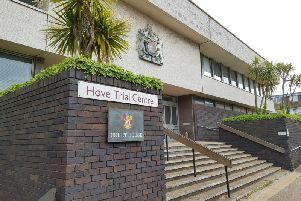 A Hastings man has been handed a court order banning him from entering shops across Hastings and Rother. Ryan Etherton, 42, of Willingdon Way, was given a 16-week prison sentence – of which the magistrates have required him to serve four weeks in custody – having been found guilty of five shoplifting offences at stores across the area. He stole goods, mostly meat and alcohol, worth almost £2,000. The three-year CBO prohibits Etherton from entering stores including Jempsons, M&S, Co-Op, Tesco, Sainsbury’s, Morrisons, Lidl, Aldi, TK Maxx, ESK and Debenhams, as he has previously stolen from those stores. In an attempt to prevent further offences, Etherton was allowed to choose where he wanted to shop and was given a condition to only use that one supermarket – Asda in St Leonards – but he must identify himself to security on entry and exit. He is also banned from encouraging any other person to commit theft. PC Richard Laws said: “Etherton has been committing these offences to feed a spiralling drug habit. The conditions of the CBO will not only go some way to preventing further offences, but a Supervision Order, also issued by the court, requires him to get help for those addictions.